Donald Trump announces his relaunch of Trump University aims to teach American women their place for a low tuition of $25,000. WASHINGTON (The Nil Admirari) - Today, Republican presidential frontrunner and pumpkin-hued billionaire Donald Trump announced he was relaunching Trump University with the mission of teaching American women their place. Senior political observers characterized the move as being Trump's way of apologizing for saying American women should be punished if they have an abortion. "Okay, American women. I have a huge and exciting opportunity for all of you to learn your proper place in America so you don't start bleeding from whatever whenever I talk about you," declared Trump at a rally boasting a crowd of angry supporters at or below a 3rd grade reading level. RELATED: Trump to Give Every Supporter at Rallies Aluminum "Freedom Bat"
Trump continued, "You know. Like being in the kitchen, and making babies, and taking care of babies, and looking pretty, and cleaning, and in the bedroom, and keeping your opinions to yourself. Because, and I love women more than anyone, no one cares what you think." "Even to God, women were like an afterthought to that guy. He basically made Eve out of spare parts from Adam, or at least that is my way of looking at it. And I keep hearing everyone is saying I am 100% right on that," explained Trump. An unidentified member of the press asked Trump how much it would cost American women to attend Trump University, and whether the university would make any changes in the event he won the White House. 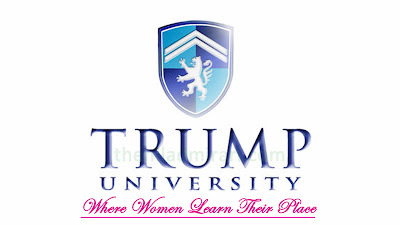 "Trump University only costs $25,000 for three amazing courses, and if I become president attendance will be mandatory for every woman in America," replied Trump.